According to a new market report published by Transparency Market Research titled “Chip Scale Package (CSP) LED Market – Global Industry Analysis, Size, Share, Growth, Trends, and Forecast, 2018 – 2026,” the global chip scale package (CSP) LED market is expected to reach US$ 3,065.1 Mn by 2026. The market is projected to expand at a CAGR of 13.90% during the forecast period from 2018 to 2026. According to the report, the global chip scale package (CSP) LED market will continue to be influenced by a range of factors such as rising demand for chip scale package (CSP) LED from many backlight LED as well as flash LED applications, smaller form factor, and higher package density. Europe will continue to be at the forefront of global demand, with the market in the region growing at above 13% through 2026. The global chip scale package (CSP) LED market is bifurcated by application into backlight LED, flash LED, automotive lighting, general lighting, and others. Others includes accent lighting and flexible edge-lit lighting. Automotive lighting application segment is projected to expand at a CAGR of more than 14% during the forecast period. 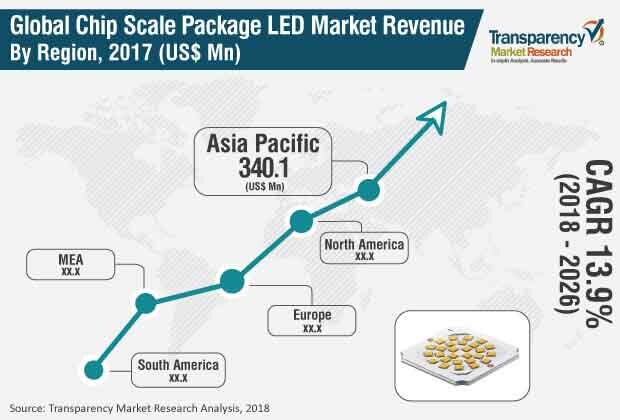 Many companies are producing CSP LEDs at a higher volume, as the demand for LED lighting for the automotive segment is increasing for interior automotive lighting and taillight. Many CSP LED providers around the globesuch as OSRAM Opto Semiconductors GmbH, Nichia Corporation, and Lumileds Holding B.V. are developingnovel automotive LED components. For instance, in 2016, Samsung Electronics, a company that provides component solutions, announced a novel CSP LED package named “Fx-CSP” to be used across automotive lighting applications. Furthermore, many companies from the CSP LED marketplace such as Genesis Photonics Inc., are seeking automotive luminaire certification for the Chinese market to enter into the supply chain. Genesis Photonics Inc. has already entered the Taiwanese market supply chain by obtaining“TS 16949” certification that is required to supply the products to the automotive industry. Based onend-user, the chip scale package (CSP) LED market is segmented into residential, commercial, and industrial.Commercial end-user is projected to hold a higher market share, as a large number of well-established players from the CSP LED domain areproducing technologically advanced products. Moreover, demand for CSP LEDs for many commercial applications namely general lighting, flash LED used across smartphones, and backlight LED for slimmer TVs is increasing rapidly. Companies such as OSRAM Opto Semiconductors GmbH have also launched CSP LED made specifically for the retail lighting related applications. Based on power range, the chip scale package (CSP) LED market is segmented into Low to Med, and high power. High power segment is projected to expand at a high CAGR during the forecast period. The growth is mainly due to the rising demand for backlight LED and automotive lighting around the globe that requires high power CSP LEDs for higher efficacy and higher beam functions. Furthermore, the growth is higher due to the lower market penetration rates across the automotive lighting segment currently. However, many companies have discovered the potential in the automotive lighting domain and are launching novel products for automotive lighting and trying to enter the automotive lighting supply chain as well as aftermarket. OSRAM Opto Semiconductors GmbH, LG Innotek, Lumileds Holding B.V., and Samsung Electronics Co., Ltd. among others are some of the major players operating in the chip scale package (CSP) LED market profiled in this study. Details such as financials, SWOT analysis, business strategies, recent developments, and other such strategic information pertaining to these players have been duly provided as part of company profiling. Manyplayers are providing novel chip scale package (CSP) LEDto be used across various applications. The “Chip Scale Package (CSP) LED Market – Global Industry Analysis, Size, Share, Growth, Trends, and Forecast, 2018 – 2026” report provides analysis of the chip scale package (CSP) LED market for the period 2016–2026, wherein 2018 to 2026 is the forecast period and 2017 is considered as the base year. Data for 2016 has been included as historical information. The report covers all the trends and technologies playing a major role in the growth of the chip scale package (CSP) LED market during the forecast period. It highlights the drivers, restraints, and opportunities expected to influence the market growth during this period. The study provides a holistic perspective on the market’s growth in terms of revenue (in US$ Mn) across different geographical regions, namely North America, Europe, Asia Pacific, Middle East & Africa, and South America. The report highlights the key trends affecting the market on a global scale. Furthermore, region wise prominent countries covered in the report includes the U.S, Canada, Germany, France, the Netherlands, Taiwan, China, Republic of Korea, Japan, Israel, and Brazil. This report analyzes and forecasts the market for chip scale package (CSP) LED at the global and regional level. The report comprises a detailed value chain analysis, which provides a comprehensive view of the global chip scale package (CSP) LED market. Porter’s Five Forces model has also been included to help understand the competitive landscape in the market. The study encompasses market attractiveness analysis, wherein end-users are benchmarked based on their market size, growth rate, and general attractiveness. Furthermore, the study also includes PESTEL analysis to understand the market as well as the environmental analysis. This research study on the global chip scale package (CSP) LED market provides a detailed cross segment and cross country analysis based on the different segments including application, end-user, and power range. Based on application, the market is segmented into backlight LED, flash LED, automotive lighting, general lighting, and others. Others includes accent lighting and flexible edge-lit lighting. Based on end-user, the market is divided into residential, commercial, and industrial. Furthermore, on the basis of power range, the market is bifurcated into low to medium, and high. The report highlights well-established players such as OSRAM Opto Semiconductors GmbH, LG Innotek, Lumileds Holding B.V., and Samsung Electronics Co., Ltd. These players are innovating novel products pertaining to chip scale package (CSP) LED. In January 2018, LG Innotek developed a “flip-chip LED package” that provides prominent luminous flux along with higher efficiency without affecting the performance. The product is in the form of chip scale packaging and is expected to be helpful for various backlighting applications worldwide.